This Sunday (today) is Amazing Grace Sunday. About 4000 churches [so far] all over USA are singing this song and looking into how they can put a stop to modern day slavery. Erik Lokkesmoe is the Director behind this project and he has been kind enough to keep me updated on its progress all the way through. I have even offered some people his way to help the process along. I really like this whole thing – good people, good heart, worthy cause, nobody out to make a buck. Details on what we are doing this Sunday and on the 25th coming up . . But in the mean time check out the resources for you (especially you worship leaders) if you want to be part of this movement to celebrate the 200th anniversary of the abolition of slavery. 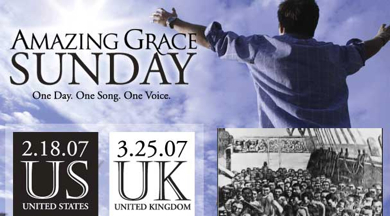 Related: Amazing Grace the movie, wiki, etc. We’re doing nothing fancy, but I’m playing several different versions of the song before, during, and after our service. A traditional version, one by The Blind Boys of Alabama (that rocks), an instrumental by Jeff Beck off the ‘Merry Axemas’ cd, and probably Todd Agnew’s. I should say though, our group has sung/sang/singed Amazing Grace at the end of each Sunday gathering for about 15 months now. We kinda like it. We’re on it in the great east of Canada. Bright stars, may they shine, of freedom in our lands of slavery. I see that this is scheduled for March 25th here in the UK. Rather surprisingly this is the first I’ve heard of it – quite disappointing that more hasn’t been heard of it. I’ll certainly make a feature of it! Thanks for making me more aware of this! Blogs are a great way to spread this type of information. I first heard of this today from my parents. My Dad is doing a message on Amazing Grace, and here in my own church I have children’s story this week so will be doing the story of John Newton to let our children and the adults as well know about what happened 200 years ago tommorrow. On Friday I received an Amazing Grace promo packet from Walden Media. Has a great DVD with a Wilberforce documentary, clips from the movie, discussion questions, and info on the Amazing Change campaign. I’ll be using the DVD with my students (I’m a youth director) at our Sunday morning gathering. Probably start with a bit of info about Wilberforce, and segue into using a clip or two to spark slavery discussion. But the most important part will be sharing the Amazing Change info. They have a great clip with Gary Haugen from International Justice Mission to introduce the campaign. Of course, I’ll be making the Amazing Change petition available as well. I wish I had received the packet from Walden earlier, to have time to share it with my pastor and try to get more of the material into the worship services… should be a good morning though. After some thought about whether this is too ‘churchy’ for me, I realized that it’s not just about the song, but about ending worldwide slavery. Which is something I definitely support, so I wrote about it. We closed the worship this morning talking about being a part of the 5600+ churches styanbding together for what God is so clearly against. It was a fitting summit to our time.